No teak decks! A wonderful bluewater cruising yacht, w/ beautiful traditional lines, full keel (5' draft), 50 hp Perkins diesel, cutter rig, 135% genoa, cruising chute, and Sunbrella sail covers, bimini, and awning, Windbugger gen. Deck painted with Awlgrip 2003. Hull painted with Awlgrip 1999. Many extras. SA(sq.ft. ): Full batton main, 135% genoa and staysail, I believe the total sail area to be 969. Additionally, I have a cruising chute which greatly enhances performance from beam reach to dead run in winds below 15 mph. 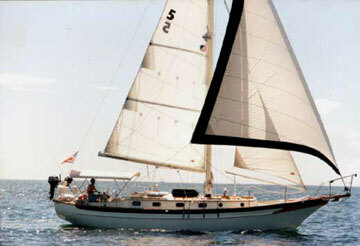 Sleeps 4 people in 2 staterooms plus 3 dinette berths for a total of 7 berths. The master stateroom is forward and may be closed for privacy. It has separate access to the head and shower. Storage is provided in two bins below the berth and two long, overhead shelves with retaining boards (one is mounted on each side of berth. I use these for clothing). An overhead hatch and 2 circular bronze opening ports provide ample ventilation. Next aft on the starboard side is the head with one piece inner liner with teak shower grate, overhead shower curtain track, hot & cold pressure water, Jabsco manual head, holding tank MSD system with Y valve and overboard discharge. A 12V macerator pump has been installed for holding tank evacuation. Other features are a large teak medicine cabinet with mirror, 2 lockers for storage, as well as an opening port and overhead dorade vent. Across from the head (to port), at the forward end of the salon is a corner table with cabinets above and below and an adjacent cedar lined hanging locker. 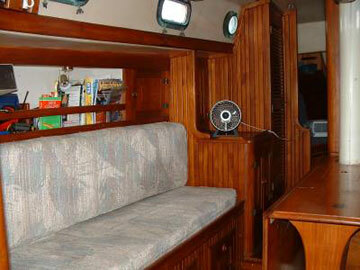 The main salon has port and starboard settees separated by a centerline double-drop leaf table. The table will seat four comfortably and six with a bit of a squeeze for dinner. 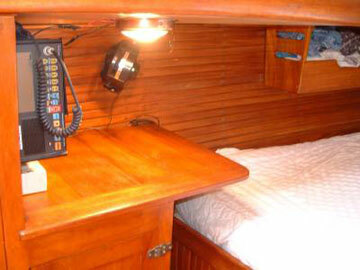 Storage is provided below and outboard of the settees and in lockers. There are bookshelves and cabinets above the settees' backrests. Ventilation for the main salon is provided by overhead opening hatches and bronze opening ports. The interior joiner work is hand-rubbed varnished, Costa Rican teak. The craftsmanship and detailing are exquisite. The cabin sole is teak and holly. The cushions in the salon were replaced approximately 5 yrs ago, and are covered with a light, multicolored pastel material. 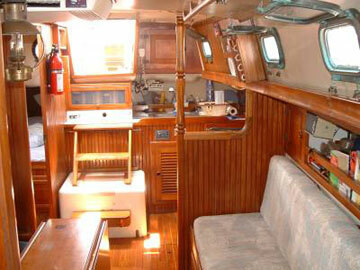 The galley is U-shaped and located on port, aft of the salon. 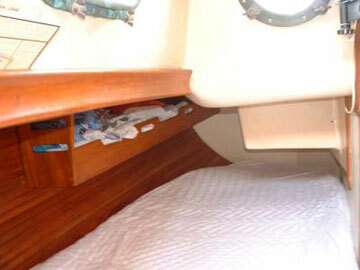 The guest stateroom is aft with a large double berth. There is a cedar lined hanging locker. 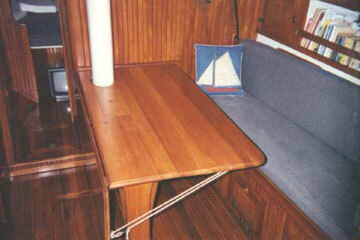 An end table at the head of the berth offers a large table top for charts and instruments and storage cabinet below. 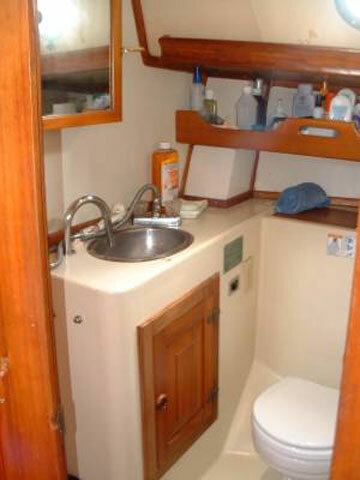 There is a drawer below the forward end of the berth and a large storage bin beneath the aft end. The battery compartment is located beneath this berth, just aft of the drawer, and is accessible from both the top and by removing the drawer. There is an overhead hatch and three bronze opening ports, the aft facing port permitting instant communication with the helmsman. Adler Barbour 12V SuperCold machine w/ holding plate was installed in 1999. It is both air cooled, and ready for water-cooling (water-cooling kit has not been installed, but is aboard). The icebox is approx. 8 cubic feet and has been re insulated with Heat Shield Marine (a waterproof product pro ported to be R30), The icebox has been divided with approx 1/3 as freezer and the remainder as refrigerator. There are external, AA battery operated, digital thermometers which report the temperature at the top of each part. The propane stove has three burners with sea rail and an oven. There is a solenoid switch for the propane system. Hot & cold pressurized water is available at the double stainless steel sinks with modern single lever water control faucet. The faucet is the type on which the head pulls out and converts to sprayer. There is also a Pur compressed carbon under counter water filter with a separate faucet at the sink. Plenty of storage is provided with a vented, large cabinet under the sink, a large bin outboard of the sink, and a large cabinet with sliding, smoked Plexiglass doors running the length of the galley outboard. 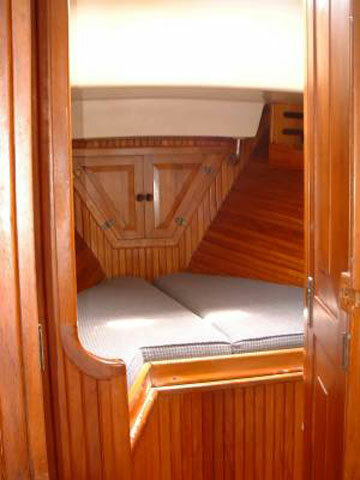 Ventilation provided by bronze ports, companionway hatch, and dorade vent. personal items not listed are not included. I have taken Natural Selection on two "extended cruises:" In 1997, I cruised with four others aboard to Cuba (one returned after a week with another regatta participant). In 2000, I cruised with one friend aboard for the entire trip, and we had two others join us at separate times. During the Cuba adventure, we encountered very rough weather while crossing the Gulf Stream in both directions. 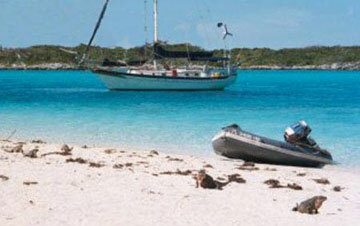 The worst weather was during the passage from Cayo Levisa, Cuba to Key West. 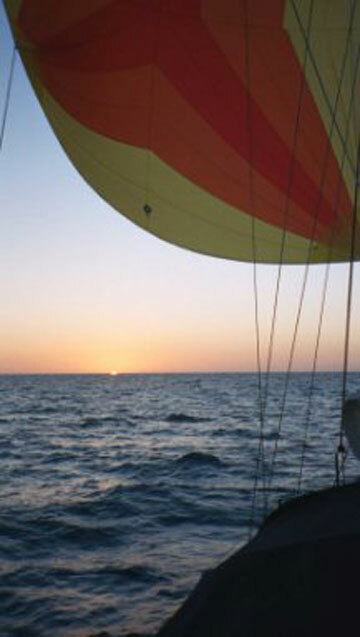 The wind was blowing about 45kts against the current and created 15-20 ft steep, short-interval seas. As the designer's quote above implies, this boat came through it well. All considered, it was a pretty comfortable passage--I even went below to sleep, though the others chose to stay in the cockpit. We made the 140nm passage in under 22hrs--mostly with a double-reefed main and the staysail. I have removed much of the on-deck hardware, removed the core from around the fastener holes, and filled with epoxy, then re-bedded the hardware. This project is intended to prevent water from penetrating the balsa core in the event that the caulking fails. Additionally, there are many spare or replacement parts and supplies for future projects. I have not had a chance to make a list of all these items. The picture below shows the original blue cushions. They now match those pictured above.